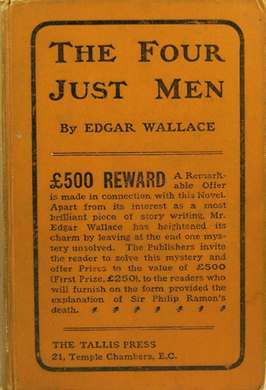 The Four Just Men (1920) is one of Wallace's many popular thriller novels. Four young, wealthy vigilantes take care of justice the old-fashioned way. It was adapted as a movie in 1921, again in 1939, as well as a popular British television series in 1959. Chapter XIII - The "Rational Faithers"
Return to the Edgar Wallace library.